Almost 2,000 years ago, Mount Vesuvius erupted and scattered ash all over the city of Pompeii in Italy. The ash was so thick that in some places it landed in piles 6 meters high. The result was catastrophic. Those who were not able to escape in time were buried under the ash and the city basically was left a ghost town. 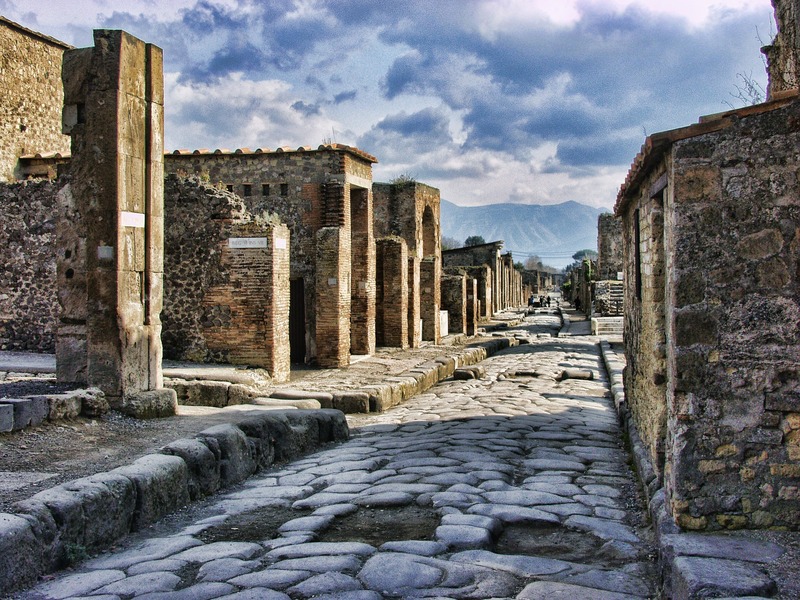 It was centuries later that archaeologists began to take an interest in Pompeii. Once the ash was removed, the entire city was found to be preserved. Pompeii became one of the greatest histories of civilization and was a perfect snapshot into the daily lives of the people of the Roman Empire. There are still many discoveries to be found in Pompeii, but now the task is to preserve the ruins. The weather is harsh and can do great damage to the millenniums-old city. Structures were needed to protect certain parts of the ancient city. However, because Pompeii is a major tourist attraction, it’s important to have protective structures that also allow visitors to see the wonderous site. Many designs were thought of, including traditional surfaces such as glass or wood. Ultimately it was decided that Corian Solid Surface would be the best material. Not only is it durable enough to protect history, but its design is actually nice to look at. The Corian Solid Surface is used as a sort of rooftop, specifically over a neighborhood of Pompeii that housed the very wealthy. Frames of galvanized steel were created and then the Corian Solid Surface was placed on top. The final color choice was Distinct Tan. This neutral color seamlessly blends in with the natural stone color of the buildings. The aim for using Corian Solid Surface was to protect history but also bring elements of design. The structures are meant to complement the ancient city and not take away from its natural beauty. If you were to take a quick glance at the city, you might even first think that you’re merely seeing the city as it once was. The innovative design of Corian Solid Surface means that there are so many possibilities. Many more historical sites face the challenges of weather erosion and tourist interest. As a result there will be an even greater need for protective designs that use Corian Solid Surface. You’ve just spent time and money to renovate your kitchen, including the addition of a new countertop. Now is not the time to hide your investment. The kitchen counter too often becomes the dumping ground, both for small appliances and miscellaneous items. It’s a flat surface which makes it easy to store papers, kid’s projects, and all manner of debris. But why spend money on a new kitchen counter if you can’t actually see it and enjoy it? Toasters can be used every day, but only for a matter of minutes. It’s time to put the kitchen toaster away. Place it in a cupboard directly under the part of the countertop that it normally sits on. If you move it further away, then it won’t be put away after being used. It’s also a good idea to place the toaster on a tray. This way any crumbs are caught, and you won’t have to deal with the mess. If you’re not completely convinced, just try the move for a week. Hopefully you’ll realize that it’s not an appliance that needs a permanent home on the kitchen countertop. And, hey, as more people go gluten-free, the toaster might just become a bit of an obsolete appliance, anyways. Chances are, you have a bin (or two) or kitchen utensils taking up space on the countertop. This includes spatulas, ladles, and flippers. Do they really need to be on the kitchen counter? It’s just as convenient to open a drawer and choose one while cooking. Find a drawer near the stove for easy use. Then, transfer the utensils into a basket or two, separating based on shape. If you’re an avid chef, then there will be an assortment of knives in your kitchen. They might not have a home, and instead live on the cutting board, just waiting to be used. You could find a chopping block to place them in, but this just leads to more clutter. Instead, place a magnetic knife strip on the wall. This is a safe, efficient way of storing your knives. No matter how hard you try, it seems like there is always a pile of paper on the kitchen counter. Bills to be paid, coupons to be used, forms to be filled out. You may think that at least all of the papers are in one place, so they can’t get lost. But look inside a junk drawer and there is probably even more paper to be found. The solution is easy, but hard to follow. Create an organizing area. Have slots or baskets that you can place each item of paper in. And, be sure to go through everything regularly. There’s not point in keeping a basket of coupons that all expired last year. Having a clean countertop is worth the effort of decluttering. As you head into the new year, you might start wondering what kitchen projects to tackle. Here are a few that should definitely make your list. Nobody wants to spend money on things that you can’t see. Which is why electrical wiring often gets relegated to the bottom of the kitchen projects list. But electrical wiring is important to focus on. If you live in an older home, have an electrical inspector come in to test the wiring. You could have old wiring or even insufficient wiring. If the previous home owner did a lot of DIY projects, your electrical may not even be up to code. The result of poor wiring could be as simple as the inconvenience of a blown fuse. Or it could be as dangerous as a fire. The problem is that you don’t know what is going on with your wiring until a problem emerges. Take preventative action and move it to the top of your kitchen projects list. Kitchen appliances are expensive, and it can be financially difficult to replace them. But if you are running an inefficient refrigerator, you can actually save money with a new appliance. By investing in Energy Star appliances, you will start seeing the savings on your electrical bill immediately. Some utility companies also offer rebates if you upgrade appliances, so you could also save that way. The point is that while the initial price tag may seem high, a new refrigerator or stove might actually be in your budget. Countertops should be at the top of any kitchen projects list. They will be one of your major purchases, but the impact that they have will make it worth it. In fact, you could get away by cutting a few corners on other projects if your countertops make a big enough splash. 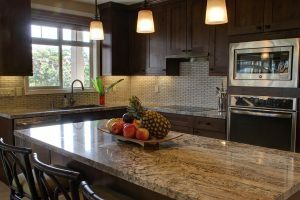 There are many types of countertops to choose from, so having an expert opinion is a good idea. A quick consult with a professional will give you a feel for what will work with your existing décor and will open your eyes to many new and exciting types of designs. Lighting can seem like a small matter, but it can actually make a big difference in your home. Poor lighting can make even the best kitchens seem dim and dingy. It can also lead to inadequate light over workspaces, making your kitchen less efficient. Before you make your first purchase, though, take a few days to track and map out the paths you make in a kitchen. Then, be sure to plan lighting that will work for your usage. Mix up one or two focal lights with smaller track lighting and accent lighting. If you are replacing a light over the kitchen table, look for a dimmable light to help alter the mood.If you are on a budget but want to start on your kitchen projects, look for lighting to give you a quick, affordable boost. Not many people have the wherewithal to invest in a complete home renovation. It therefore ends up being the budget that determines just what part of the house gets updated. 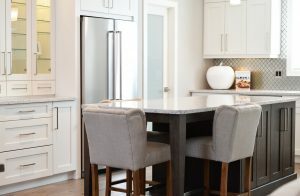 If you’re not sure if investing in a kitchen is a good idea, here are four reasons why it’s always a good idea to invest in a kitchen. An updated, modern kitchen will go a long way in selling value, if you choose to move. But don’t wait until you decide to move to invest in a kitchen. After all, you’ll want to enjoy the hard work that you’ve put into it. Even kitchens that are five years old still have a large selling value. When remodelling, try to choose a more neutral, classic choice. This way anyone who looks at your house can envision themselves in it. If you need to add your personality to your kitchen remodel, choose bright walls. Putting on a new coat of paint is easy if you plan on selling in the future. There are a lot of appliances in a kitchen, and that means ample opportunity for sky-high utility bills. Investing in new appliances means that you will save when it comes to electrical and even gas bills. Look for Energy Star appliances that have been manufactured to smartly use electricity. Also look for different settings. A dishwasher, for example, that can run quick or half loads means that you won’t have to use as much water to get a small number of dishes clean. Many local utility companies will also offer rebate programs, so check out their websites to see if you can save even more money. The kitchen is the most-used room in a house and can quickly take a bit of a beating. 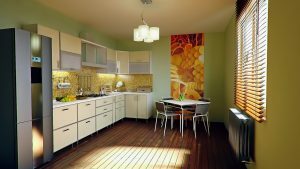 While bedrooms and even the living room usually just need a fresh coat of pain, the kitchen will need a complete overhaul in its lifetime. Knicks in the countertop, broken cabinet hinges, dings in the tile: all are common in a kitchen. It’s definitely not practical to remodel your kitchen every two or three years but start planning on when it makes the most sense. If you have small children, wait until they are in school. This way they’ll not only be out of the house more when the repairs are happening, but they will hopefully be out of the complete mess stage of toddlerhood. The final reason why investing in a kitchen is always a good idea is really quite simple. You use your kitchen a lot and want to enjoy it. A kitchen should inspire you and make you want to bring people together. If it doesn’t, start envisioning a new kitchen’s potential so that you can add a bit of joy to the home. 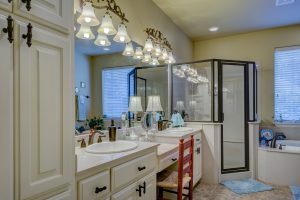 Remodelling a bathroom is a fun, creative experience, but often the number of choices becomes overwhelming. The focal point is often the shower, as this can be a very large piece in the bathroom. How you design your shower is an important part of the creative puzzle. One design element that is picking up steam is the shower surround. Easy to install, customizable, and pleasant to look at, shower surrounds are the way to go. Shower surrounds are less expensive than tiling a shower. Most people have a finite budget when it comes to a bathroom remodel, so price is a very important issue. Shower surrounds can help keep your budget in check. Not only will they fit most people’s budget, but because they still look nice, you can use the money that you saved on other elements of the bathroom. No matter the size of your shower, there is a shower surround that will fit the space. There are pre-fab surrounds and there are also custom-made surrounds. So if you have a unique space then no worries as there will be a way for a customized shower surround to fit. Shower surrounds are usually just one or two pieces and even these pieces will be expertly sealed together. So, cleaning becomes a lot easier. You can simply spray and wipe down the interior of the shower. Tiles are easy to clean, but the grout in between them is a lot harder. Grout can quickly become discolored and often needs to be cleaned with a special brush. The silicone seal between tile and a bathtub is also the perfect place for mold to grow. This seal needs to be expertly cleaned. If not, it often needs to be dug up and replaced to keep it looking fresh. Shower surrounds come in many different varieties, so no matter what your design plans are, there is an option for you. There are flat designs but there are also designs with built-in shelves. Some even have benches built in. Shower surrounds have kept up with modern designs and no longer look out of place in new bathrooms. Leaks in any bathroom are always a concern, no matter the type of material that is used. When you have a shower surround expertly installed, you can be assured that there will be no leaks. Instead the plumber will make sure that the pipes behind the wall are tightly sealed. Only after this is determined will the shower surround be installed. When selecting a color palette for your new kitchen, it all comes down to personal taste. There are many ways to create a welcoming environment and color is just one of them. Here are the top 5 kitchen color trends this year and ideas on how to achieve the look you want in your kitchen. Go big or go home with color. Whether it’s neon green, apple red, or deep blue, one of the top kitchen color trends includes pops of color. The nice thing about this trend is you get to decide just how much color is included in your kitchen. And, you can start high or low. Color on the ceiling is certainly a bold move, but one that can separate your kitchen from others. 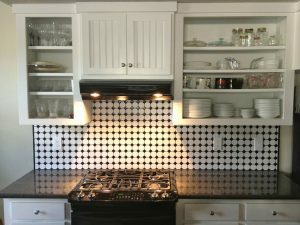 If you’re not sure about being that daring, opt for accent walls, kitchen cabinets, or even a bit of color in your tile. If you want color but are nervous about making too bold of a statement, then opt for earth tones. Natural browns and tans help create a warm environment in a kitchen. This color choice is easiest seen in kitchen cabinets. Choose natural woods and instead of painting them, stain them. This way the wood grains are accented and become the focal point of the whole kitchen. While beige once reigned supreme, it has now been taken over by grey. There are many shades of grey, from light off-white to deep storms, so choosing gray again comes down to taste. This neutral pairs well with other bold colors and can help make your kitchen seem open. Gray is one of the kitchen color trends that will stick around for a while. An all white kitchen remains one of the most classic of kitchen color trends. All white signifies space, cleanliness, and openness. At the same time, it also creates a welcome feel to the kitchen. The really nice thing about an all white kitchen is that you can easily add pops of color if you want to change the décor around. 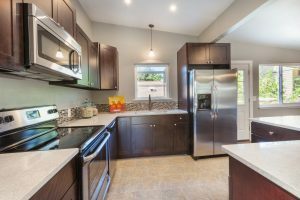 This means that as your tastes evolve, you can add different lighting fixtures or accessories and change your kitchen without having to invest in a large renovation. Metallic accents is one of the hottest kitchen color trends right now. While chrome and stainless steel have always been kitchen favorites, new metallic choices are also emerging. Copper is big and can be seen in copper mugs and copper pots and pans. Gold is also a popular trend and can be seen in many kitchen accessories. Metallic accents bring a lot style wise, so use them carefully. They are best used in small amounts to as to not overwhelm the existing décor. The kitchen island is often the focal point of a room, and it’s important that it not only looks good, but has a purpose. Here are some tips on how to keep a kitchen island functional. The best way to keep a kitchen island functional is to use it for storage. Whether it is open shelves or hidden shelves, be sure to have a kitchen island that works for you, not against you. Large, stationary kitchen islands often have shelves behind cupboard doors. This is great except, depending on the size of the island, these shelves can actually be quite deep and impractical. If you find this is the case, don’t be afraid of creating extra doors on the other side. This way you can access the shelves from both side and keep everything better organized. If your kitchen island has open shelves, be sure to invest in stylish bins and baskets to keep everything organized. Wire baskets will fit in a rustic-themes kitchen. Stainless steel bins adhere to a modern look. This is an easy way to add décor and add to your theme. Whatever the design, the best way to jeep a kitchen island functional is organize is so that it works for you. Keep utensils that you use every day close at hand. Put larger, less used items, farther back. Function is the key to organization. A Kitchen island is often stationary, but if you have the opportunity to create a movable kitchen island, be sure to take it. Portability gives you the freedom to move your kitchen island according to your needs. If you are short on counter space, then an island can quickly maneuver to be extra prep space. It can also be positioned as a place for appetizers so guests can nibble and watch you in action. If there are extra bodies in the kitchen than normal, then moving the kitchen island out of the activity zone may actually be the best bet. Move it to the side or out of the room completely so that nobody accidently stubs their toes. Kitchen islands that are portable can also serve double duty as a table. You can move it into an open area, add some bar stools, and a cozy table for two is set. The biggest downside to a kitchen island is that they can quickly become a dumping ground for all sorts of odd and ends. There are two approaches to combat this. The first is to have a clean surface rule. Under no circumstance is there to be anything on the kitchen island except meal prep. Be sure, then, to have adequate homes for all the junk mail, keys, and miscellaneous that often finds its way to the surface. The other solution to keep your kitchen island functional is to acknowledge that it will always be a place for clutter. Then, create an organizing system. Have small baskets with labels ready. Put out a mail slot to keep flyers upright and accessible. And be sure to go through everything at least once a week to weed out expired coupons and children’s permission slips. Before you dive into your next project, think about the many kitchen reno mistakes to avoid. Read on to help you plan your dream kitchen. Not sticking to your budget is one of the biggest reno mistakes to avoid. It’s so easy to try to justify the next purchase because it looks so nice. Planning a budget is more than just picking random numbers out of the air. It requires a lot of research and a bit of fluidity. When starting a budget, think about how much you can reasonably spend. Important factors to consider are if you will be selling the house in the near future or now. If you plan on moving, then it may be wise to scale back; after all, even if it looks nice, there’s no guarantee that the new buyers will even want to keep the new design. If you will be staying in the house for a long time, then try to spend the top of your budget so that you can get the most enjoyment out of it. Once you have a total budget, minus 10% from this number. That 10% will be your contingency fund; once you start tearing down walls, there may be a lot of unforeseen costs. With this new number, start dividing it into categories: appliances, paint, accessories. Don’t forget costs for items you can’t see, like plumbing and electrics. Keep going back to your budget as your kitchen reno progresses. If you always know your numbers, then one of the kitchen reno mistakes you can avoid is going over budget. There are three main parts of the kitchen that create a triangle workflow: the sink, the stove, and the refrigerator. Make sure that there is a clear path between these elements. Practice going between the three areas and envision yourself prepping, cooking, and cleaning. If you find that you have to walk around the island to reach the refrigerator, then you may need to rethink the design. This kitchen reno mistake needs to be thought of early in the planning stage. It’s a lot harder to move a sink after a completed kitchen reno than before. It can be easy to overlook appliances and go straight for tile, countertops, and cabinets. But appliances should really be the first step in a kitchen reno. Refrigerators come in many different depths and widths. Stoves, too, can vary in width. Instead of having a gap between the stove and the countertop, place the appliance first so that the countertop can be measured to fit exactly. It’s also a good idea to find out how noisy your dishwasher will be. It’s nice to be able to turn on the dishwasher immediately after dinner. But, if the living area or TV area are right next to it, then it can easily disrupt your evening plans. Finally, an important kitchen reno mistake to avoid is forgetting about the big picture. Don’t pick out individual accents or appliances until you compare them to the entire scheme. This way everything will flow together and be harmonious. Kitchens are a big investment. From floors to countertops to cabinets, each piece can cost a lot both in terms of time and money. Often when choosing to remodel a kitchen, at least one element is sacrificed. If you’ve decided on new countertops but still want to do something with your cabinets, painting them is a good idea. It takes a lot of time and effort, but if done correctly, the results can be well worth it. First of all, pick a time that you will need your kitchen the least amount. If you have kids, wait until they are in summer camp or can spend some time with their grandparents. Summer is a good time as it means you can use your BBQ instead of the stove. 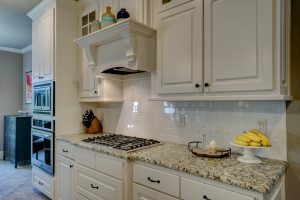 No matter when you decide to paint your kitchen cabinets, be aware that you will want people to spend as little time in the kitchen as possible. The first step to paint kitchen cabinets is to remove them. Detach any hardware and be sure to label everything. Some cabinets may look like similar sizes, but can actually be off by a bit. Save time at the end by labelling which cabinet door goes where. Next, sand down the doors using-grit paper. As you go along, if you see any holes or scratches, use wood filler to even the surface. After the filler has dried, be sure to sand any remnants down. First, prime the wood. This ensures that everything is sealed and there is a nice, even color to begin with. Make sure the primer is completely dry. It can be tempting to rush but if the paint is still a bit tacky, then it can ruin the next coat of paint. When it comes to actually painting kitchen cabinets, you have two options. You can use a brush or you can use a paint sprayer. What you choose will depend on your comfortability and your space. If you do not have a garage or yard with which to use a sprayer, then a brush will have to suffice. If you can, however, a paint sprayer will provide a more even texture to the cabinets. It is best to practice with it on a some wood, just to get a hang of the sprayer. The cabinet boxes and any trim should be painted with a brush. Once everything is dry, it is time to reassemble the kitchen cabinets. You can definitely use your existing hardware and hinges, but now would be the perfect time to replace anything that looks dingy. Hardware can be relatively inexpensive but makes a big difference in a room. There are also great hinges that close lightly which can alleviate hard knocks and loud noises. Make sure you take before and after pictures so that everyone can admire your DIY prowess! 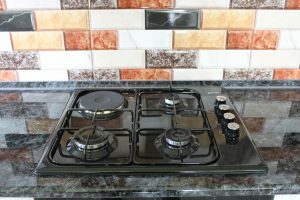 A stove is an important part of any kitchen which means that it should be properly researched before deciding what will work best for you. There are many times of stoves but the most popular are electric, gas, and induction. Electric stove types are the standard appliance, especially with any new houses. Within this category are either coil burners or glass-covered burners. Most new electric stoves are usually housed under a glass surface. Electric stoves are the industry standard mainly because they are energy efficient. Electricity is usually less expensive than gas so you will save money both on the appliance and your utility bill. The biggest negative with electric stoves it can be difficult to find the right temperature for your cooking. They can take a long time to reach a high heat and an even longer time cooling down to a low heat. This can result in burned cooking quite easily if the stove is not attended to. It often takes a person a lot of practice to find the best ways to cook on an electric stove for consistent results. Loved by professional and hobby chefs alike, gas stoves were once considered one of the best stove types. The reason for this is that they offer near instantaneous heat change. Instead of waiting for an electric stove to change to a new temperature, gas stoves change as soon as you turn down the flame. While older models required you to light the flame yourself, which was a deterrent to some, newer models have a button which lights the flame for you. All this results in a much more user-friendly device. One downfall to gas stoves is that they can be harder to clean and need a bit more scrubbing power. Thankfully, newer models have better materials and there are more powerful cleaning agents suited specifically for gas stoves. Induction stove types are becoming more popular thanks to their innovative technology. In fact, they can almost be seen as a hybrid between electric stoves and gas stoves. Induction stoves use electricity but because of their technology, finding the right temperature is similar to the ease that gas offers. Induction stoves use magnetic technology to work. Under the cooking surface are a series of electromagnets which react to the pots and pans places on top of them. The resistance that is created results in the heat used for cooking. As a bonus, the cooking surface remains cool which is especially great if you have children with curious hands. There are two drawbacks to induction stoves. The first is that you need specialized pots and pans. Most cookware is labeled as to what stove type it will work on, so it is easy to purchase. This does mean, though, that it can be an added expense. Expense is the other drawback to induction stoves. Because this is newer technology, most inductions stoves are more expensive than electric or even gas. They are a big investment. Thankfully, as induction stoves become more prevalent, the price is beginning to decrease.